This duplex once adjacent to the Keaton Studio is still standing – more below. 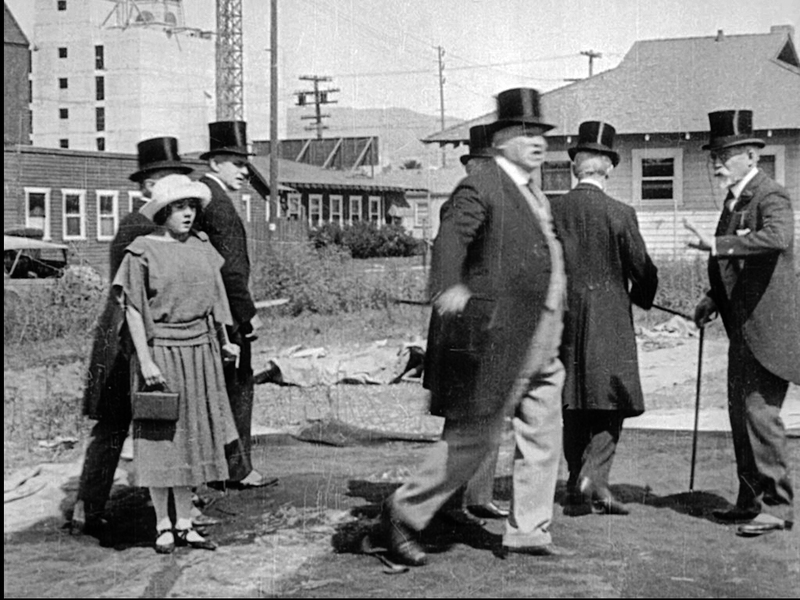 Buster Keaton unwittingly documented the urbanization of the once agricultural Colegrove region of Hollywood in the background of his films. As reported in my book Silent Echoes, the quaint Cahuenga Valley Lemon Growers Exchange warehouse once stood across the street from Buster’s small studio (see below), appearing in the background during scenes from his early shorts The Scarecrow (1920) and The Goat (1921) (see further below). 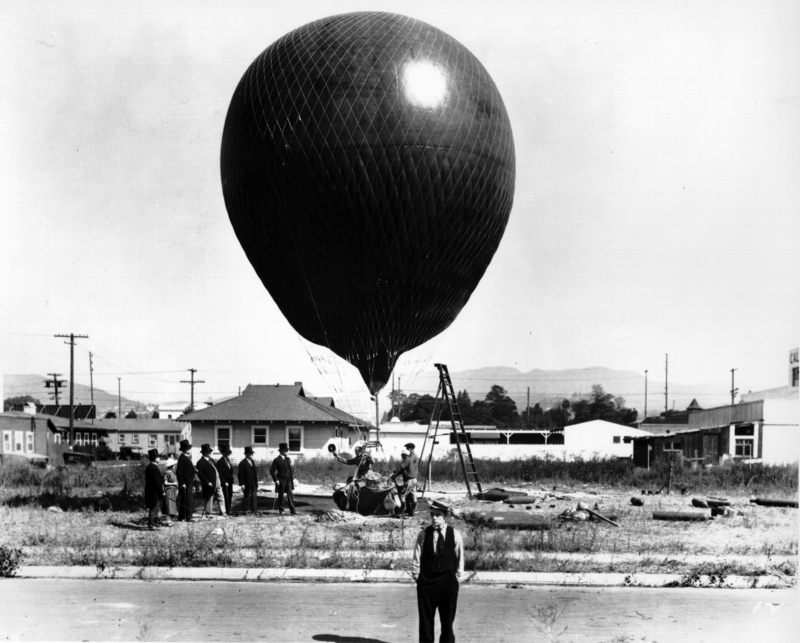 By 1923, it was gone, replaced by a six story storage warehouse on Santa Monica Boulevard, still standing today, that appears to the upper left during this scene looking north from The Balloonatic (1923) (right). 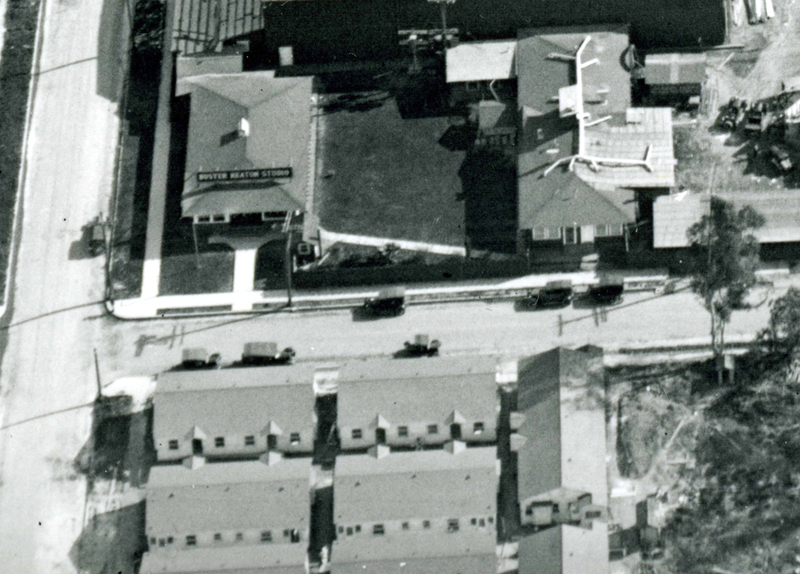 The dark horizontal rectangle near the center of this image is the back of the Keaton Studio sign, with many dressing room windows along Lillian Way to the left, and office bungalow windows at the center. 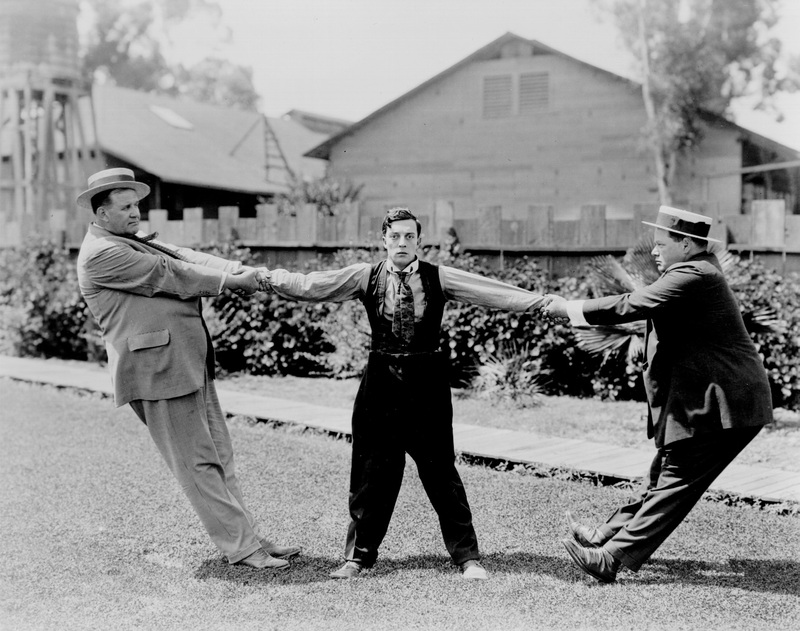 Looking north at the lemon warehouse across the street – Buster with Big Joe Roberts and Roscoe Arbuckle on the studio lawn. Below, views of the warehouse, looking north at left, from The Scarecrow, and looking west, from The Scarecrow and The Goat, upper right and lower right. If you click to enlarge the lower right image you can actually read the warehouse sign through the trees above Buster. While I was vaguely aware that other modern buildings encroached north of Buster’s studio, I never bothered to investigate them until now. It turns out that a very dense cluster of 10 duplexes was crammed into a tiny corner lot directly across from Buster’s bungalow office. Their addresses ranged from 1051-1051 ½ to 1069-1069 ½ Lillian Way. This 1923 view looks south towards the studio – HollywoodPhotographs.com. 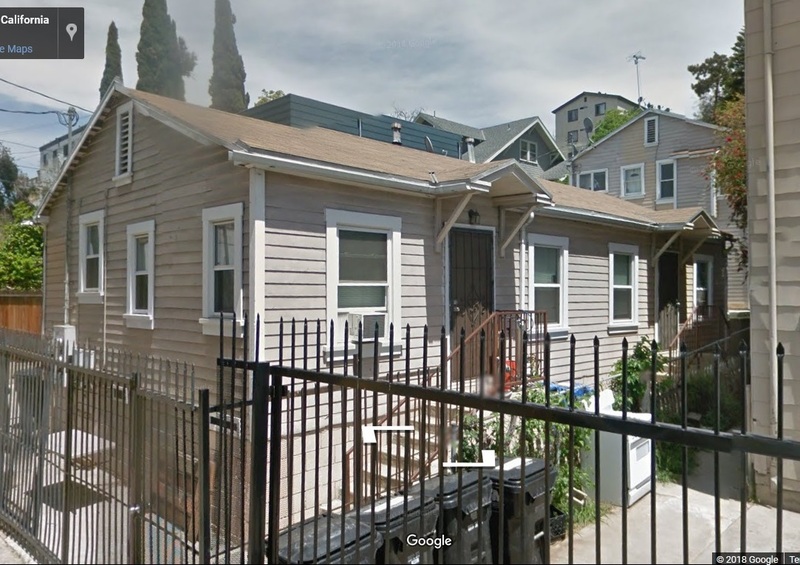 10 duplexes, 20 units, each tiny 4-room unit barely 500 square feet in size. The building permits for these units were all pulled on Christmas Eve, 1921, with construction completed early in 1922. 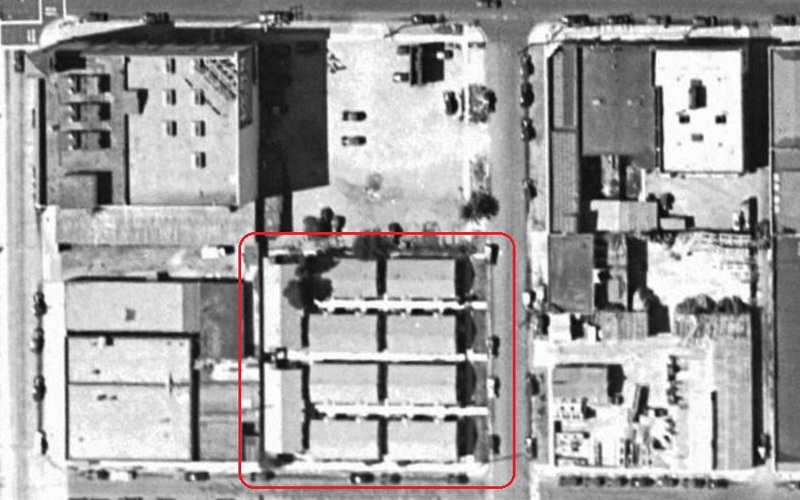 This 1938 photo looking north (right) shows the duplexes on Eleanor and Lillian Way (box) and the warehouse on Santa Monica Blvd. at the upper left. USC Digital Library. Note in both photos that four duplexes with widely-spaced porch entrances flank a very narrow courtyard, while at the end of each narrow courtyard the fifth duplex in the group has closely-spaced porch entrances. Despite their tiny size, these units were not later demolished, but were relocated, the southern 5 duplexes moved in 1947, and the remaining 5 units in 1955. Above, a view north from a cropped publicity still (left) for The Balloonatic, showing the side, back porch, and corner of one of the 10 duplexes. Though not the same unit in the vintage photo, the color view of 445 Coronado Terrace (the former 1065 – 1065 ½ Lillian Way unit) shows matching back porch and window pattern details. The color view also shows 441 Coronado Terrace (the former 1061 – 1061 ½ Lillian Way unit) up in back. This unit was built atop a tall, sloping foundation, to allow the other end of the unit to front the uphill street. 445 Coronado Place, left, with widely spaced porches, 441 Coronado Place, right, with closely spaced porches. Presumably these tiny homes were built to accommodate studio employees, both Keaton’s, and the much larger Metro Studios a block further south. When the Hollywood Metro Studios shut down in 1924 to become part of M-G-M in Culver City, the appeal of these homes may have suffered. From the Los Angeles Times, September 3, 1926, advertising 1065 ½ Lillian Way for rent. Adjusted for inflation, the $30 monthly rent equates to roughly $425 a month today. The unit advertised here now stands at 445 Coronado Terrace, see above. The widely spaced porches of 445 Coronado Terrace. Most of the units were moved from Hollywood to much larger parcels in places such as North Hollywood, Van Nuys, and Sherman Oaks. With more land available, it began to make sense to think big, so not surprisingly seven of the units, once relocated, were ultimately demolished to accommodate larger homes. Remarkably three units still survive, 441 and 445 Coronado Terrace, west of Echo Park, left and above, and below, behind an existing small home at 3048 Wabash Avenue east of Boyle Heights. 3048 Wabash Avenue – the back unit was moved from the Keaton Studio – note the wide porch entrances. The small home to the left was here originally. Color images (C) 2018 Google. 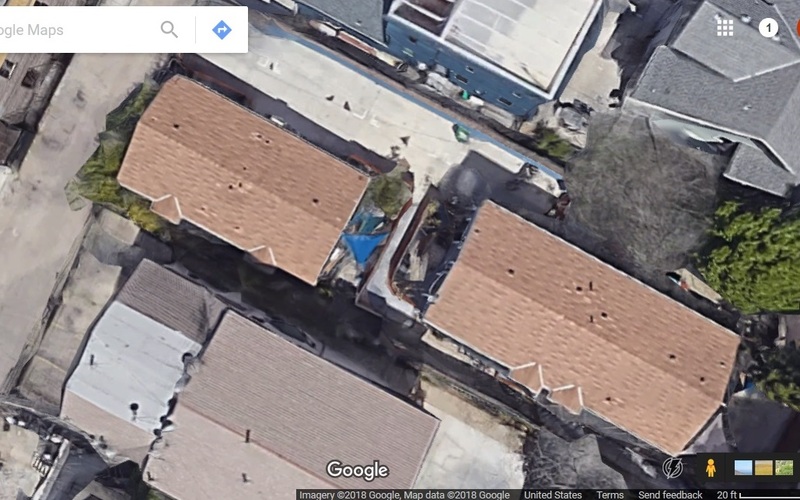 Below, the Google Street View of 445 Coronado Terrace. This entry was posted in Buster Keaton, Keaton Studio, The Goat, The Scarecrow and tagged Buster Keaton, Keaton Studio, Silent Comedians, Silent Comedies, Silent Movie Locations, Silent Movies, The Balloonatic, The Goat, The Scarecrow, then and now. Bookmark the permalink. Incredible sleuth work, John. You never cease to amaze me! 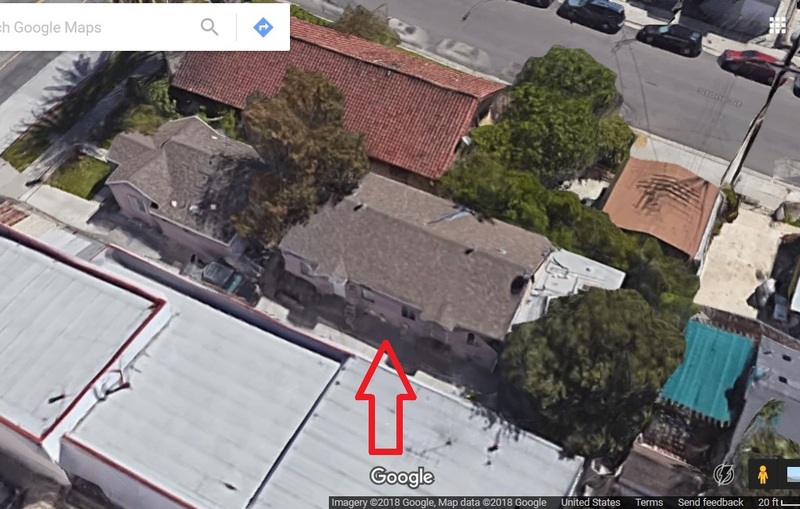 Thanks Javi – it was really fun to spot that first duplex on Coronado looking exactly the same. If Walls Could Talk…Thanks John for giving these structures a voice from our silent Keaton past! Great work! But how were you able to track the moved or demolished buildings? I’ve only been able to use the LADBS site for finding permits for existing buildings. Thus, one cannot search for a building permit based on old address, you need to know where the building ended up. And if it was later demolished then the LADBS site is no help. Am I missing something? Thanks for a very interesting post. My wife lived in a condo of precisely this size when I met her! You have an original address as “1051-1501” — have two of the digits been transposed here (ie. 1051-1051)? I agree = XLNT sleuthing ! !